NOTE: When calling this number during the week, please be aware that the message may or may not be picked up before the following Sunday. If it is URGENT, use the e-mail system, or call one of the officers. And always remember to fully explain the reason you are calling.When calling in to say you will not be attending cadets, remember these two things: Call BEFORE parade begins and always leave a REASON for being away. Interested in learning more about the Air Cadet Program? 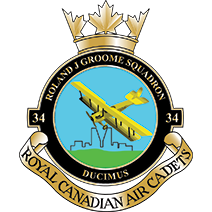 Visit the Air Cadet League’s Website! Want to talk to other cadets in Air, Army, Sea, and around the world? Have some questions about the Air Cadet Program? Website issues to report / Have announcements or media you would like to see here? Need to find some Cadet Documentation; such as Instructional Guides, CATOs, standing orders?